Hundreds of thousands of Muslims have taken part in a protest rally called by separatist leaders in Indian-controlled Kashmir’s main city, Srinagar. 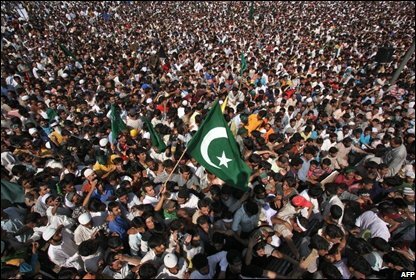 The rally ended with the leaders calling a three-day strike, beginning Saturday, in the Kashmir valley. This is the fourth big protest in the Muslim-dominated valley in less than two weeks. Anti-Indian sentiment has grown following a dispute over the granting of land to a Hindu shrine organization. More than 21 people died last week in the valley after police fired on protesters. Trouble began two months ago when the state government granted a small piece of land to a trust running the Amarnath Hindu shrine. After violent protests by Muslims in the valley, the order was rescinded which led to equally violent protests in the Hindu-dominated Jammu region of the Indian state of Jammu and Kashmir. Friday’s protests come after three days of relative calm in the valley which allowed residents to stock up on supplies. Through the morning, hundreds of vehicles and thousands of people on foot marched towards the Eidgah ground in the old city area of Srinagar. Schools, businesses and shops were shut across the region and a large number of troops deployed on the streets. The support for the marchers could be gauged from the fact that a large number of people – including women – were lined up by the road-side cheering them on. In many places, the marchers were offered fruit juices and women could be seen praying for their success, our correspondent says. The crowds thronged the Eidgah ground where senior separatist leaders Syed Ali Shah Geelani, Maulvi Omar Farooq, Shabbir Shah and Yasin Malik took stage. However, they could not address the rally as the public address system got disconnected by the milling crowds. The row started two months ago when the state government said it would grant 99 acres (40 hectares) of forest land to the Amarnath Shrine Board. Muslims launched violent protests, saying the allocation of land was aimed at altering the demographic balance in the area. The state government said the shrine board needed the land to erect huts and toilets for visiting pilgrims. But following days of protests, the government rescinded the order, prompting Hindu groups to mount violent protests of their own.